When I moved to Egypt, in many ways it seemed to be country frozen in time. That changed irrevocably in January 2011, and since then I've seen friends complaining that they feel they've aged about 10 years in a few months. It is really hard to keep track of where Egypt seems to be going and how it's going to get there. I read the news from a million sources religiously and find that most of the mainstream media get a pretty limited view. News seems to come from statements from people and institutions which can tell you what they want you to know, but not necessarily what it means or feels like. So I troll through half a million tweets from activists and journalists looking for somewhat more obscure but well-written articles and blog posts that can fill in the gaps. Twitter is very useful in this respect as it's very interesting to listen in on discussions between journalists covering the same region (most of mine are, quite naturally, based in the Middle East) as they debate the relevance of news items. We are sliding into our presidential elections at this point. The turnout for the People's Assembly vote was an amazing 70% and the interpretations of the results went on for weeks. Most of the new members of the Assembly were from either the Muslim Brotherhood or from the Salafis, with a reasonable number from the liberal coalition and some other smaller parties. Most people were concerned that this would signal more emphasis on sharia law and conservative tradition...was Egypt going the way of Saudi Arabia? When my staff, grooms and gardeners who all live in the villages near me, told me that they were going to be voting for these three parties, I was surprised to hear that the liberal coalition was in the list. None of them struck me as the Salafi type, although the Brotherhood was no surprise so I asked what the logic there was and the reply surprised me. They weren't voting for religion. They simply wanted to be sure not to vote for any remnants of the old regime and felt that these three parties were the safest. This was borne out by a discussion of the election results that noted that the percentage of candidates elected who could be traced back to the previous regime was tiny, perhaps 3%. So perhaps what Egyptians were voting for was change more than religion...but then again, perhaps it wasn't. I guess we will find out. As I've found that most of the news coverage of Egypt has concentrated on only a few aspects of life here, I've been keeping my eye out for broader coverage and would like to recommend a few blogs that will help with this. Zeinobia at Egyptian Chronicles writes political posts for the most part with a very personal perspective. Her latest post looked at the football ultras protest that preceded the announcement of the charging of over 70 people in connection with the tragedy at the Port Said football match. The implication is that the protest pushed the army to lay the charges, but given the number of police and security personnel who have been acquitted by the courts and the willingness of the "government" to release people in prison who are willing to pay a portion of their ill-gotten gains, the likelihood of conviction is small. 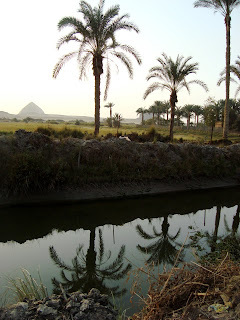 Zeinobia also is blogging about a trip she's taking to upper Egypt and posting videos. Mahmoud Salem, aka Sandmonkey, has been blogging since 2006 and is one of my favourite bloggers on the Egyptian political scene. He started blogging anonymously due to family connections to the Mubarak regime's party, the NDP, but came out with his own name after January 2011. His posts are some of the best thought out commentary on Egyptian events available. He ran for the People's Assembly but unfortunately didn't make it...hopefully for us he might manage next time, though it might be unfortunate for him. Maurice Chammah, who writes Adrift On The Nile, is from the US and studying journalism in Egypt on a Fullbright. His perspective on Egypt is different and his posts are as well. A recent one looked at the very local music scene in Port Said. With his slightly foreign perspective (yes, we do notice things that locals take for granted, just as they see nuance that we often miss), his blog fills out part of a complete picture. Baheyya, an anonymous blogger, has been at work almost as long as I have, since 2005, and I've enjoyed many of her posts enormously. The blog was very quiet for a while, but lately has become more active with a very interesting post on the youngest presidential candidate. The age factor of Egyptian politics and power cannot be underestimated, and I've heard people say that the changes we are going through are as much a matter of generations as ideologies. The Arabist, which is largely written by Amrani Issandr, a journalist, is a different sort of blog. As a journalist, he works with news stories, presenting Arabic stories in translation to show what is going on in the Arabic press, and often posting the work of other journalists in this area. He doesn't simply look at Egypt but also at the rest of the Middle East. Global Voices collects blog posts from all over the world and offers them in translation and also often in the native language. They have websites in over a dozen languages and the editors and aggregators are skilled at picking out important posts from the different countries. They should be a frequent stop when anyone is trying to make sense out of the news. Ahmed Awadalla, who writes Rebel With A Cause, looks at a lot of different issues, most recently the needs of rural women. Even urban Egyptians have little knowledge about life in the villages and they tend to imagine all sorts of odd things. Lest I totally overwhelm people with a reading list that no one could handle, I will add just one more view point today. Sarah Carr is a mudblood as the post-Potter people call our half Egyptian half Something-Else population. Being the mother of a couple of these and friend to many, many more, I have a special affinity to the interesting, often humorous and sometimes slightly skewed point of view of our less pure Egyptian population. Her posts at Inanities are often extremely funny and always worth a read. If you find her byline on a piece of journalism as well, and you will quite often, it is a cue that this definitely should be read. When I began blogging about Egypt in 2003, nine years ago now, there really wasn't much out there on the internet to counteract some pretty shoddy reporting in the main stream media. Thankfully, that is no longer the case and Egypt is emerging in the minds of people abroad with a much more rounded personality. We aren't sure where the road we are on is leading us, but we know it won't be backwards to the past. One way or another we move forward to a new definition of one of the world's oldest countries. I am Malte Zeeck, the founder of InterNations. I personally find your blog very inspiring and enjoyable to read. The whole InterNations community is with you in your Egypt's adventure. I would like to know whether there is a way to contact you by e-mail: I would like to talk to you about having your blog featured - as a recommended blog - at InterNations. I am sure that the people of Egypt is strong and will soon forget all the troubles and problems and recovery of the crisis! Great list! Thanks for the post and insight.